Until it is ready, this previous website is being maintained at www.bromleyartsoc.org.uk. Please be patient with us. Bromley Art Society was formed in 1947 to bring together local painters and sculptors, art teachers and students, and all who share an appreciation of the fine arts.Most of its members are amateur artists working in a wide variety of media; oils, watercolours, acrylics, pastels, gouaches, pen and ink, prints and batik. This is the annual exhibition for members of Bromley Art Society at Ripley. We will be using the drawing room and dining room, and will also have the use of the display cabinet. It would be good to see a library of recent sales to appreciate the types of work purchasers enjoy. One of our best and most exciting exhibitions for a long time! 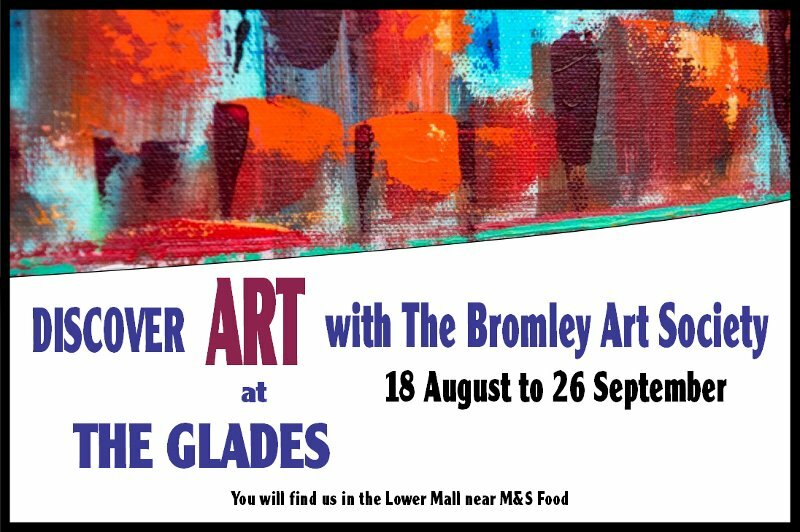 Bromley Art Society is exhibiting in The Glades from 18th August to 26th September 2018. You will find us on the ground floor opposite one of the entrances of the Marks & Spencer Food Hall. There will be a complete refresh of the exhibition every two weeks - more or less three exhibitions one after the other - and there will be extra works from time to time, so visit often! The artists will be taking it in turns to be there, and may be demonstrating their techniques. If you want to know more about taking part in the exhibition please look at these files. Finally, we're going to be having an exhibition in the Glades. This is very exciting news for all members. We have the unit from 16th August to 28 September. We will be using the first 2 days to set it all up to look awesome. All help welcomed. Please check your emails to find out how to be part of this. Our exhibition organiser will be in touch. We know 6 weeks is a long time to show work, but we hope to rotate work so more can be shown. I don't know about you, but I'm jumping up and down at the prospect. Maddie was our youngest member at 13 years of age. She has completed two years at Worcester University reading Illustration. Check her latest news on our Facebook page. Ripley Arts Centre exhibition. Do not miss! Lewisham Art Society has a long tradition of sketching and painting outdoors. The first meeting this year will be Saturday 12 May at Greenwich, Bromley Art Society members are invited to join us. Future dates and more info are included in the attached flyer.